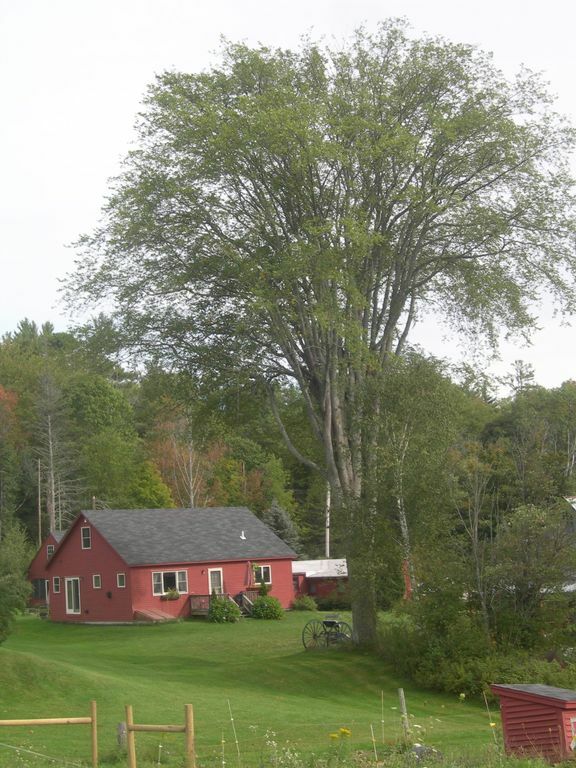 Located on a secluded 100 acre farm established in 1790, the Bunkhouse and Elm View Cottage at Free Will Farm are fully appointed, cozy, self catered units in the Dartmouth/Lake Sunapee region of Vermont & New Hampshire's 'Upper Valley'. Wake to the sound of a rooster crowing, enjoy farm fresh eggs for breakfast and then relax poolside. Year round seasonal attractions for young and old abound. Join our friendly country community at the many fairs, farmers' markets, festivals, band concerts and cultural events. Nearby Lake Sunapee State Park (10 minutes) offers summer lake activities, hiking, and winter skiing. Additional regional choices for skiing, hiking, bird watching, fly fishing, golf, tennis, theatre, dining, concerts, museums, flea markets (boot sales), antique shops & auctions are all within minutes. Enjoy America's heritage with a trip to Boston (under 2 hrs)! Experience rural New England landscapes on your drive to nearby major tax-free discount shopping outlets. Your holiday choices are all here for you to enjoy. Our pool is shared with all guests (The Elm View Cottage and The Bunk House). No nighttime swimming, please. Our 'International Barn' adjacent to the Bunk House is available for additional overflow living space and is great for young or old guest relaxation. Check your bird list, browse the library, or recall the day's adventures in screened comfort. The kids might want to spend the night in the barn! No additional charge! My husband and I loved this cozy little winter getaway in New Hampshire. The cottage had everything we needed for our stay. Newport has nice restaurants and shops and is close to many interesting sites (Sunapee, Saint-Gaudens Museum, Dartmouth College). I particularly liked hiking along the Sugar River trail. Paul, his wife, and staff were great to work with. We look forward to returning. Was relaxing & peaceful. You get to enjoy the animals without any of the work. Owners were nice. This is truly a New England gem. Perfect for us (4 adults - 1 in wheelchair) for a ski weekend with NEHSA at Sunapee. Family and friends (12 total) joined for dinner and we had everything we needed. The peaceful, scenic property complete with friendly farm animals was the perfect re-set to our regular, busy work week. Thank you Paul and Cathryn, we will be back!! Thank you for your kind words. We certainly hope you return so I can meet the rest of the family! It's currently -7 degrees but "That's NH"
The farm is even more beautiful in person! It is an absolutely lovely place. We were greeted by one of the owners, Paul, and his two sweet dogs. Paul gifted us with a loaf of bread and a dozen farm fresh eggs, which made for some simply delicious breakfasts. Between the two of us, my partner and I couldn't help but polish them both off in two days. We loved the layout of the Bunkhouse, which is simultaneously cozy and functional. The kitchen had everything we needed to cook our meals, and the fireplace was perfect for both warmth and atmosphere. Our dog spent most of his time sleeping in front of it. We loved that the Bunkhouse comes with a semi-private patio and hot tub located just outside the front door, although the rainy weather did not permit us to use either. But we could see how nice it would be to spend some time out there, just reading, eating, or soaking, while taking in the quiet beauty of the surrounding gardens. We did brave the rain for a short time in order to walk around the farm and meet some of the animals. The property is gorgeous and it is fun to meander around to meet the pony, donkey, chickens, Highland cows and sheep. Our goal was to get away from the city for a weekend, hole up somewhere peaceful and remote (but with easy access to a town/ amenities), and the Bunkhouse at Free Will Farm fit the bill. The only negative thing I can say was that the bed we slept in was very uncomfortable. The mattress was soft and lumpy, and it somehow sussed out my body's weak spots and made them worse. I did not sleep well at all. The rest of our time there was so pleasant, though, that the lack of good sleep was practically a non-issue. I did not talk to the owners about it because maybe it was just us? But I also do think it is worth mentioning. All in all, a wonderful place to stay. I recommend it. Beautiful Bunk house on stunning NH farm! What a beautiful property and animals. We truly enjoyed the stay and hope to return soon. Lovely place. The kids were thrilled with the farm and I really enjoyed the comfort of the hot tub! The cabin has everything we needed and it was a great choice for a weekend stay. Newport, New Hampshire (chartered 1761) is situated in the 'Upper Valley of the Connecticut River watershed, a natural border for two northern New England states, Vermont & New Hampshire. Both provide numerous tourist & adventure attractions for visitors. Nearby (12mi) Lake Sunapee & Mt Sunapee State Park provide summer and winter recreation for all ages. Pillsbury State Park (18mi) is a hidden gem with great wildlife viewing and wonderful exploring via paddle or foot. Across the Connecticut River are other ski/hiking destinations, Mt. Ascutney and Okemo Mountain. The Augustus St. Gauden's National Park in nearby Cornish, NH is an easy drive and was the home to one of America's premier sculptors. Head up the motorway to the town of Hanover & Dartmouth College, home of The Hopkins Center for the Performing Arts. Also in nearby Vermont is Woodstock, with great shopping, dining and tourist attractions, as well as the Marsh Billings Farm Museum and National Park. Nearby Quechee is home to the Vermont Raptor Center and Simon Pierce Glass Blowing Factory. Make Free Will Farm your base for holiday fun & relaxation. Friday & Saturday are weekend nightly rate $150. Sunday - Thursday are charged at the weekday nightly rate of $135. *Normal check in time is 3:00pm. Normal check out time is 11:00am. *Flexible check in and check out times are usually available. Call for check in or out time details prior to arrival. There is an additional 9% NH State Rooms Tax. Above rates are for double occupancy. Additional guests add $25 per night. Weekend rates apply to holiday periods.